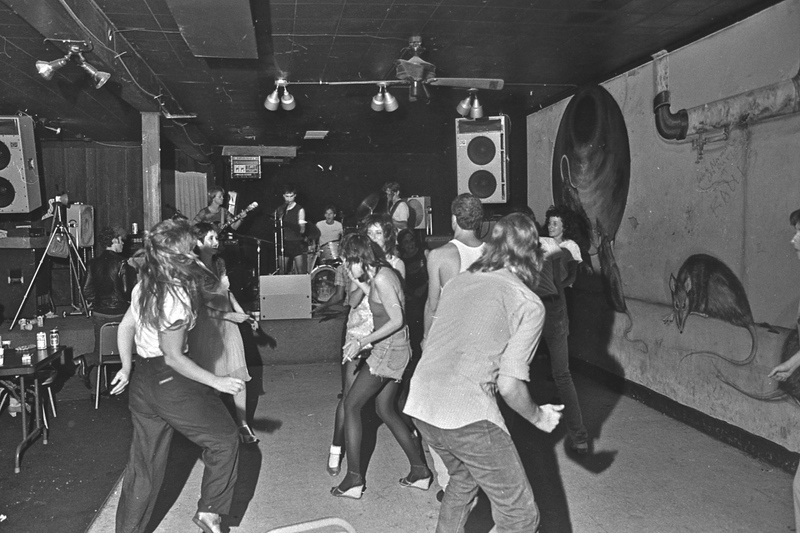 Photograph, Raul's Club in Austin on its last day, April 1, 1981. Raul's was Texas punk's epicenter between 1978 and 1982. Photograph by John H. Slate. Image available included in accordance with Title 17 U.S.C. Section 107. RAUL’S CLUB. Raul’s Club was a bar and nightclub located at 2610 Guadalupe Street in Austin. It was initially opened as a Tejano club on December 31, 1977 by Roy “Raul” Gomez and manager Joseph Gonzales (1945–1996), often referred to as the “Godfather of Austin Punk Rock.” The headlining act for the opening night was local Tejano band Salaman. The modest 3,171-cubic-foot building was built in 1944 across from the northwest end of the University of Texas campus and has changed names and ownership many times before and after Raul’s. Prior to and after Raul’s it had many colorful names, including the Touchdown Lounge, the Pink Lizard Lounge, the Buffalo Gap, Gemini’s, the Hungry Horse, Sunshine’s Party, and the Texas Showdown. Photograph, Raul's Club in 1980. In the photograph, the mural of rats can be seen on the right wall. Image available on the Internet and included in accordance with Title 17 U.S.C. Section 107. Raul’s was furnished with pool tables and a bar in the rear; a stage was in the front of the room, with a very small dressing room adjacent to the front door. Among the club’s notable features was a ten-by-twenty-foot mural depicting rats painted in 1979 by Sarita Crocker and Claire LaVaye. In spite of its intended Mexican-American clientele, Raul’s was quickly swept up into the Texas punk rock scene and became its epicenter between 1978 and 1982. According to legend, writer-musician Jesse Sublett approached Gonzales in January 1978 to book his band the Violators (also featuring Kathy Valentine of the Go-Gos). Partly because of its proximity to the university, a steady stream of punk and new wave bands—many of them staffed by students, ex-students, and scenemakers—appeared on the club’s stage and drew increasingly larger audiences. Photograph, Phil Tolstead singer for the Huns is being arrested at Raul's Club after a small riot with Austin police. Image available on the Internet and included in accordance with Title 17 U.S.C. Section 107. Raul’s Club made headlines internationally in Rolling Stone, New Musical Express, and other media outlets when, on September 19, 1978, the Huns singer Phil Tolstead was arrested with five others after an altercation with Austin police that escalated into a small riot. The club also weathered obscenity charges for flyers deemed too lewd for public display. Among the local bands that played Raul’s were the Skunks, the Standing Waves, the Dicks, the Big Boys, the Reactors, the Ideals, Joe "King" Carrasco and the Crowns, Sharon Tate's Baby, Boy Problems, the Re*cords, the Chickadiesels, the Delinquents, D-Day, the all-girl band the Foams, the Action Toys, the Stains, the Gator Family, the Radio Planets, the Derelicts, the Rejects, and many others. Bands from around the state also appeared. Many touring punk, new wave, and related acts played Raul’s, including the Psychedelic Furs, Fear, Black Flag, the Subhumans, the Plugz, and the Dils. A number of live recordings were made at Raul’s, including; Live at Raul’s, recorded in 1979; a 1980 extended-play single by the Ideals; and perhaps most importantly the split LP The Big Boys & The Dicks—Recorded Live at Raul's Club, recorded September 19–20, 1980. Raul’s closed in February 1980 but reopened under the ownership of Steve Hayden. The club closed for good on April 1, 1981, with a show featuring five local bands. Austin Chronicle, February 4, 2008; December 8, 2000. Daily Texan, April 3, 1981. Barry Shank, Dissonant Identities: The Rock ‘N’ Roll Scene in Austin, Texas (Hanover, New Hampshire: University Press of New England, 1994). Handbook of Texas Online, John H. Slate, "RAUL’S CLUB," accessed April 25, 2019, http://www.tshaonline.org/handbook/online/articles/xdr01. Uploaded on May 19, 2015. Modified on July 18, 2016. Published by the Texas State Historical Association.